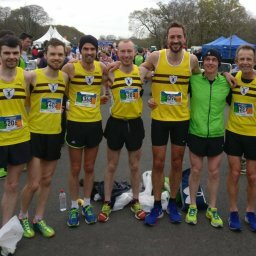 Over 70 harriers took part in the annual “race around the river” midweek, some headed west for the half marathon and plenty ran around parkrun locations across Ireland, in England and as far afield as Germany at the weekend. A wet and slightly windy Wednesday did not deter the crowds of juniors and seniors from the club, nor did it dampen spirits or performances. 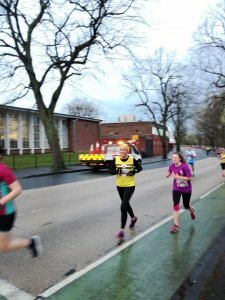 Starting at the Annadale Embankment and finishing at the Queen’s Sport PEC car park, the course is always flat and fast. The club enjoyed success at both individual and team level, notably the abundance of course and distance PBs, in addition to the first and third spots in the Men’s Club Championship! 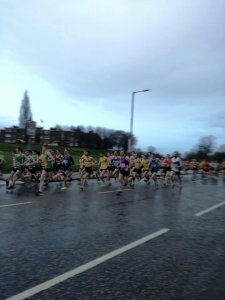 The 30th SPAR Omagh Half Marathon and 5K Fun Run took place on Saturday morning. Another sell out event did not disappoint from start to finish, literally! 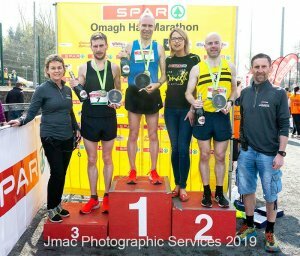 Mark McKinstry ran an excellent time of 1h 8min:41, beaten to the top spot by Gary O’Hanlon after what he described himself as a “tough battle”. (Gary O’Hanlon Running; Facebook) Well done to all harriers on the results. Harrier Elisabeth Hewitt French celebrated 50 parkruns at Waterworks on Saturday – Congratulations! And well done to all those who ran, achieved PBs or placed top in the various events .